And so we, the master builders of the realm, set out to build a kingdom. 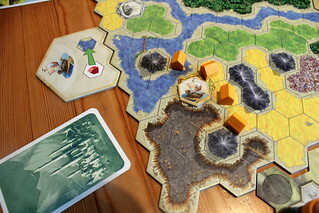 The landscape of the kingdom is randomly built – the creator of this world had the same attention span as the king – from four of the eight available map quarters, each of which with a hex raster of fields. No matter which quarters those are, there are always five kinds of useful landscape: grass, canyon, desert, flower field – yes, really – and forest. There are also two less useful kinds of landscape: water and mountain. Spread around each quarter you’ll also find one or two castles and one or two special locations that are unique to that map piece. Once you have the landscape build, you have to find the king’s three random subjects to tell you how they’d like their villages to be laid out. The king’s plan to build his kingdom this way isn’t exactly the most sane one, but he’s paying well and can have you tortured if you disobey. The customer is, literally, king. Some of the king’s subjects are even sensible about this whole plan: the Miners and Fishermen, for example, want villages build next to mountains and water. The Merchants want you to build connections between locations on the map – castles and special fields – to use as trade routes, Workers want you to build around those fields because that is where they find work. Citizens and Hermits are harder to please, but still somewhat sensible: one wants one big, connected area of villages, the other wants as many separate areas as he can. (Come on, dude! You’re a hermit, just stay away from the villages.) Having those two in the same game makes for a fun contradiction in scoring points. The same goes for the remaining two pairs which also abandon all pretense of sanity in their demands and just delight in bossing you around. While the Lords give points to the player with the most villages in each quarter of the map the Farmers reward the most even distribution. And, worst of all, Discoverers and Knights demand that you build villages in many different horizontal (east to west) lines or many villages in one of those lines, respectively. As I said, completely bonkers. You can’t expect sane subjects under a mad king, can you? The fish’s smell starts at the head, as the German saying goes. But at least now we figured out what the king will rewards us for. If those goals are contradictory, well, tough luck. Or good luck, really, because those games tend to be the most interesting. To get the king’s rewards, it’s time we started building villages. Each turn, you play your one hand card – not much choice involved there, you really only have one hand card – and place three of your houses on the landscape shown on your card. The placement is made interesting by one detail in the rules: you have to build adjacent to your houses already on the map if you can. The “if you can” part is important here, because you’ll spend quite some time and ingenuity in Kingdom Builder making sure that you can not place new houses next to the existing ones. If you cannot build next to your existing villages, you may build anywhere on the map that is the right kind of landscape, and that is good for scoring – depending which crazy people you’re trying to please, at least – as well as for your special actions. Special actions are the fun twist in the game. You gain them from building villages next to the special locations on the map. Not the castles, they are boring and will only give you points when the game ends. Nothing interesting ever happens in a castle. But the other locations hold chips with special actions that you may take when building around that location, and start using on your next turn. Five of them let you build additional settlements on your turn: one more on the landscape your card showed (Oracle), on Grass or Desert (Farm and Oasis), on the edge of the map (Tower) or as a continuation of a line with at least three villages (Tavern). All of those villages have to be next to your existing ones as well, just like the regular ones. Three more special actions allow you to move one of your villages: either onto the terrain your card shows (Barn), or onto a water field somewhere (Harbor) – the king is experimenting with floating houses, the inhabitants didn’t comment on that beyond “blubb”. 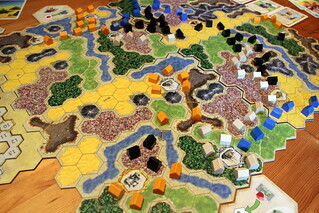 Finally, the paddock allows you to move one village by two fields along a straight line and is easily the most useful in games where you have it: as the only special action, it ignores the rule to play next to another village if possible, so you can jump your villages around any way you like. We ran into one rare but annoying balance problem with the special abilities: for unknown reasons, there are only two oracle and harbor tiles available while all the other specials have four. We – randomly, I swear – set up a four player game with the oracle and the three moving abilities. The first two players grabbed the oracles and, since the game ends when one player has all his houses on the board, ended the game while the two unfortunate players where still sitting on eight villages each. Needless to say, they didn’t have a chance to catch up in points. But the mad king probably had a good reason to create his kingdom like that. Any other setup we tried, the special abilities seemed perfectly balanced and created a nice tension between grabbing them and fulfilling the various contradicting scoring requirements. Very rarely is a turn in Kingdom Builder obvious, you always have to consider multiple factors. You really shouldn’t worry much about the aforementioned balance issue, though. It was annoying, but there is little chance of it coming up again. In Kingdom Builder, you get 1680 different game boards. 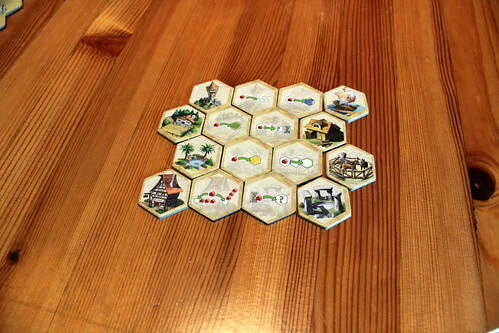 You also get 120 possible combinations of scoring rules, giving you a total of 201.600 possible game setups. At least if my permutations formulae from school haven’t left me entirely. Even if they did, Donald X. Vaccarino’s Spiel des Jahres 2012 allows for a ton of different game setups and, believe it or not, each of them does play slightly differently. That’s pretty amazing for a game with basic rules as simple as this one. I saw and heard many complaints on the interwebs about the “one hand card” thing, saying that it didn’t leave you enough choice in your actions. To those people I say: I completely disagree, only having one hand card is a stroke of genius in this game – and only in this one, don’t misquote me on that! – and probably the only thing that makes Kingdom Builder work at all. I was unconvinced before I tried the game as well, but if you had three or even five hand cards, you could play almost everywhere on every turn. The game would be utterly boring. Only having one card is a restriction that forces you to be creative with the means at your disposal, and it’s good exactly as it is. It seems a bit odd to have one hand card, but just think about it as drawing a card on your turn while giving you time to think on the other players’ turns. Kingdom Builder plays quickly and fluidly despite the multiple scoring rules to consider. Of course, having only one card does introduce a portion of luck, but it’s the point of the game to manage that luck by building smartly and making good use of your special actions. It’s rare that you lose a game only because your cards were bad. Just because of this small element of luck and because of the restrictions coming from having only one card, Kingdom Builder is a fun, engaging game that you can play with your gamer friends as well as with your family, and a deserving Spiel des Jahres winner. But when playing with your family, try and hold back on the blocking moves: you can play Kingdom Builder with a high degree of nastiness, getting into everyone’s way wherever you can, but playing peacefully is just as fun.